I’ll start with saying I am slightly tensed. I don’t know if it’s actually fair calling it tensed but I am certainly not feeling relaxed. There is certain degree of uneasiness that I am experiencing since last night and it is only increasing. The reason of course is the big clash tonight. Even though it’s T20, which many cricket pundits don’t consider as ‘real cricket’ but nevertheless, it is a match on one of the finest cricket grounds in the world, in the biggest T20 tournament and it’s India vs Pakistan in a (sort of) must win situation for India for more than one reasons (present situation and past history). This is surely not the first time India is playing against Pakistan and this is not the first time I will be watching this contest. In fact, the last time they played in WCT20 in Sri Lanka, I was there at the R.Premadasa Stadium in Colombo watching it with a few Pakistani supporters by my side who I met earlier in the day in Colombo itself. The cover image used on this post was in fact clicked on that day (September 30, 2012). But still, I have experienced something different this time. That is the role of the Internet and all things digital. Exposure to comments of R.Ashwin comparing this match to “border rivalry” and Waqar Younis suggesting that history can be rewritten and that having lost the first match despite being the pre-tournament favourites, it’s India who would be under pressure was almost instant and recurring every since the comments were made thanks to News websites and their apps and the social media. There is nothing new with pre-match comments from players, ex-cricketers and coaches indulging in mind games but what is definitely relatively newer is fans and supporters indulging in this directly. I really appreciated the punctuality of #PakvsInd trending on Twitter as soon as clock struck 00:00 hrs last night. It’s a different story that it changed to #IndvsPak when I woke up today morning but I was amazed to see SIX of the Top Ten trends on twitter in Pakistan being directly related to this match. India has just one #IndvsPak which emulates the Worldwide trends tally. Is it fair to assume then that the Pakistani fans are feeling much more pressure than their Indian counterparts? And I would like to believe that it has more to do with the history of Pakistan not having won even a single match against India in a World Cup that is making them restless, uneasy and abusive too. There was a hashtag #IndiaRonaNahi trending for a brief period last night and as you might have guessed the tweets on this hashtag were aggressive in nature, some abusive, few trolling and I spotted 3 tweets (from Pakistan twitterati) condemning the use of this hashtag and accusing it of spreading negativity. Move away from these hashtags and my timeline is flooded with memories/rituals/predictions/analysis of the match. Similar but much subdued is the case on Facebook. There was also a fake scorecard doing the rounds (of course by the Pakistani twitterati) suggesting a thrashing defeat for India. 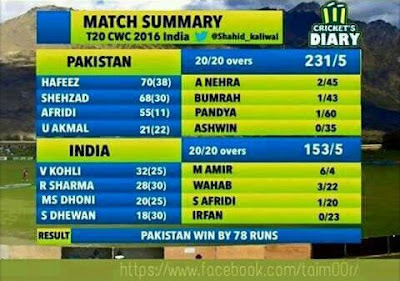 A closer look at the scorecard and you see that despite receiving flak for his comment of being loved more in India than Pakistan, despite innumerable failures, despite being mocked at for multiple occasions of announcing and coming out of retirement, they see Shahid Afridi as their brightest jewel, the one they believe would create the turning point today. That, honestly, gives me a lot of confidence and also relieves me of a bit of the unnatural, unnecessary pressure I am subjecting myself to just by exposing myself to these digital imprints. I can’t help but compare this with the good old days when the discussions would largely be in the classroom, school bus, playgrounds or in cases where you hear people discussing it in the market or discussions between relatives, etc. The exposure was so limited and consequently the scope of the discussion and the limited perspectives. And that what the Pakistani fans would be upto in the run up to the event was something that crossed my head rarely and even if it did my canvas of imagination was pretty limited too. But now, the only choice I have to keep myself out of all this exposure (which honestly I don’t want to) is to lock myself in a room with no TV or Internet access. I can only imagine what The XI would go through with the media, Internet, people around, hotel staff, groundsmen and many others all staring at them like those villagers with eyes full of hope looking at Bhuvan! The villagers would’ve had to pay huge sums of money had they lost but what we, the fans and supporters, have here is nothing more than pride and ego at stake and that being amplified to infinity thanks to digital mediums that allow us to have face-offs, emulate sledging and troll countrymen and supporters of the two teams directly, in real-time with just a small handheld device.